My guilty evening treat in early summer isn’t cake or ice-cream or biscuits. It’s a bowl of home-poached forced rhubarb, kept on the top shelf of the fridge. Poached rhubarb is completely different to stewed rhubarb. Stewed rhubarb is perfectly good in its place – which is in winter and covered in crumble. Poached rhubarb is soft, yet keeps its shape, and produces a delicate pink syrup that promises summer (or at least some sophisticated summer cocktails). 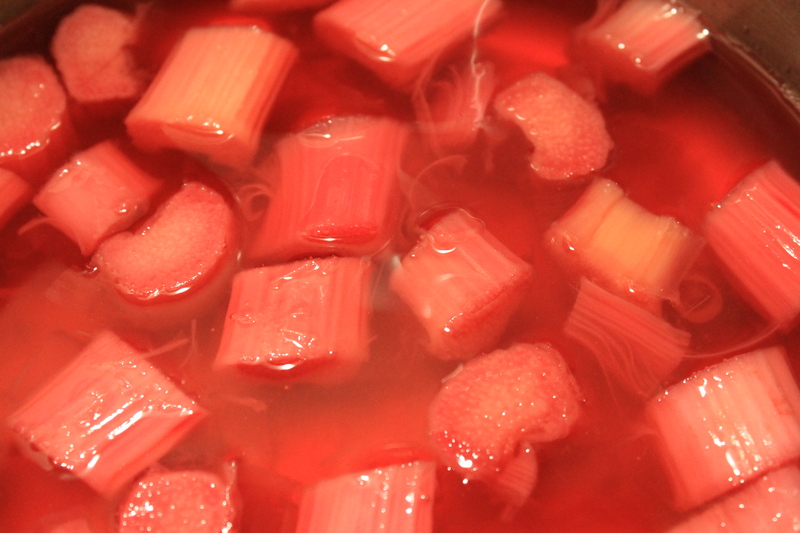 Most recipe books and food blogs (like this) make poaching rhubarb unnecessarily complicated. 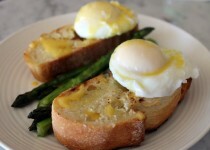 You don’t need to do it in batches or time the poaching exactly. Instead, bring to boil 150 grams of sugar and 180 millilitres of water to make a simple sugar syrup. Turn off the heat and straight-away pop in 2-3 stems of raw rhubarb, cut to about 1 inch lengths. Pop the lid back on the saucepan and leave to cool. I don’t like vanilla with poached fruit, although I know many would add an old scraped out vanilla pod to the syrup. If you’re lucky, like me, you’ll be the only one in your house with a palate for this amazing vegetable. And because it’s a vegetable, you can even pretend that your evening treat isn’t guilty at all.